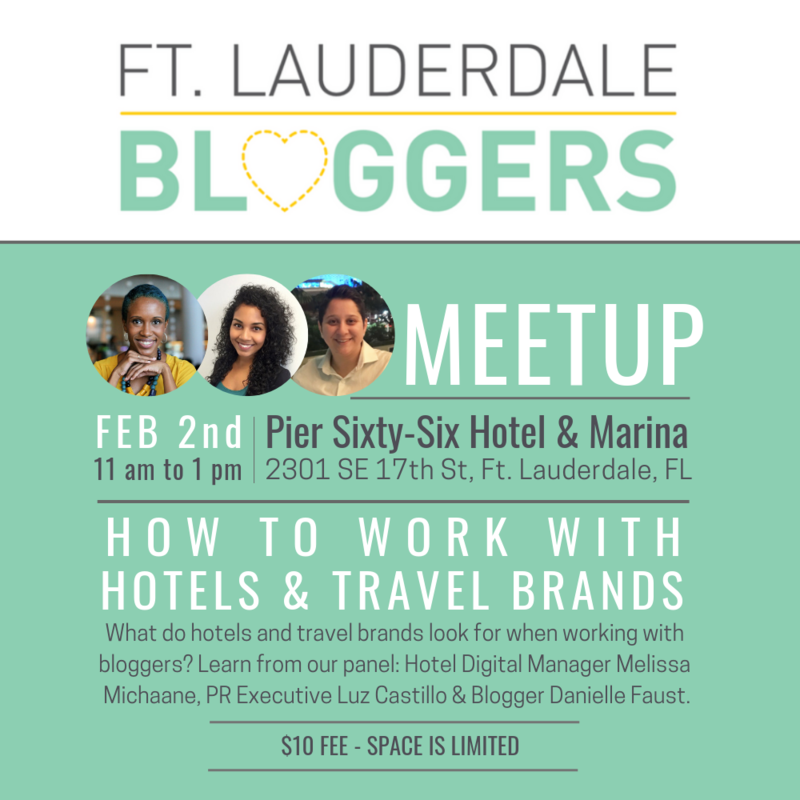 Learn how to work with hotels and travel brands at our February meetup. You’ll get an inside view from both sides: PR and marketing experts who represent hotels and an experienced travel blogger. Join us at the beautiful Pier Sixty-Six Hotel & Marina, our sponsor, with light bites provided by the hotel’s Pelican Landing restaurant. Danielle Faust is an intuitive life coach and blogger based in South Florida. She candidly creates written and video content for OKDani.com, a positive lifestyle blog focused on family, wellness and travel. A mom of two, she also teaches bloggers how to monetize and earn a living from their digital presence and hosts the HappyBlackMoms interview series. Find her on YouTube, Instagram and Facebook. Melissa joins us from Pier Sixty-Six Hotel & Marina where she is the Social Media and Digital Manager. She oversees the social media and digital marketing initiatives for the property, along with the restaurant off the docks of the Pier Sixty-Six Marina, Pelican Landing. Prior to joining Pier Sixty-Six, Melissa was with The Ritz-Carlton Caribbean and Mexico Hotels, where she was responsible for their public relations and social media. She led the development of a social media influencer marketing strategy to share brand experience and managed highly visible blogger/influencer CRM campaigns. She also served as Task Force in Communications and Public Relations for the Ritz-Carlton, Lake Tahoe. With over ten years of experience in the hospitality industry, Melissa has a passion for storytelling and creating authentic experiences that evoke emotion through social platforms in an ever-changing digital environment. Melissa is originally from New York and is fluent in Spanish. In her spare time, she loves trying out new restaurants around South Florida. You can follow @piersixtysix on Facebook and Instagram. Luz Castillo is a Senior Account Executive in the Travel/Lifestyle practice of New York-based PR firm, Finn Partners. In this role, she assists with developing creative communications strategies for traditional, digital and social media for clients including the Greater Fort Lauderdale Convention & Visitors Bureau, Kimpton Hotels, the Jamaica Tourist Board and more. You can follow Finn Partners on Facebook. Thank you to our sponsor, Pier Sixty-Six Hotel & Marina and Pelican Landing restaurant.